To put it simply, I think Chrono Trigger is the best video game, period. Between the fun and memorable cast, the great story, the amazing music and interesting battle system, it’s just the perfect game. Plus, you know, time travel! Anyone who has played through the game knows that we could do a feature on just about any of the main (and, I would wager, many supporting) characters, but I’m going to focus on my favorite character in the game, Frog. A character who originally comes off as a standard chivalrous knight (though in a strange-looking package), Frog actually hides a lot of pain and inadequacy under his courtly exterior. Frog has experienced a lot of pain and loss in his life, and it takes some time, as well as a little outside assistance, to finally help him overcome it. Seeing him conquer his internal demons is one of the more satisfying moments in the game. As always, we’re going to be venturing pretty deep into spoiler territory, so read on at your own peril. 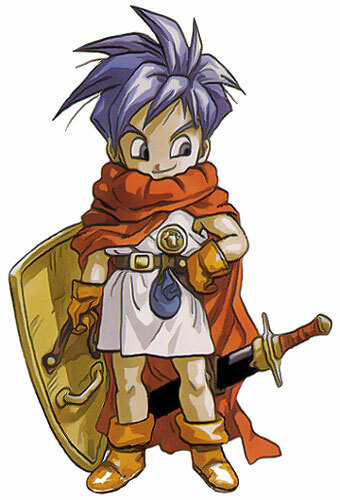 When Crono and Lucca travel back to the Middle Ages for the first to save Queen Leene, they find that she is being held in a cathedral infested with monsters. Upon entering, they are attacked almost immediately. After fighting off the first line of defense, another monster appears and attacks Lucca. Suddenly, out of the shadows, a frog-man appears and dispatches the beast with a single slash of his sword. 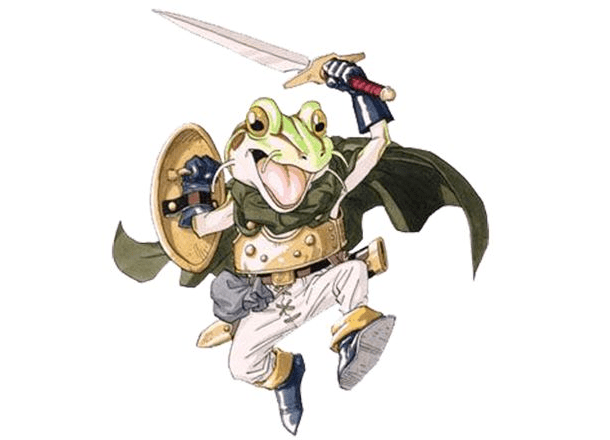 The strange warrior, who calls himself Frog, offers his services to Crono and Lucca, as their goals run parallel – saving the queen. 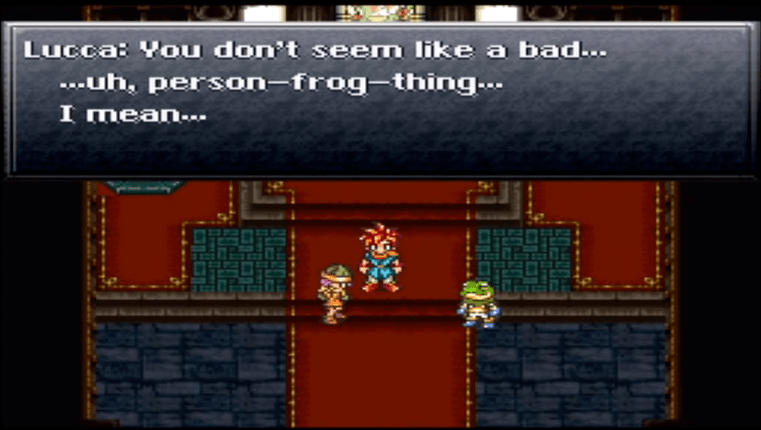 We first get a glimpse into Frog’s personality when Lucca reacts fairly negatively to seeing a large sword-wielding frog. The world of Chrono Trigger has a pretty simple “human good, monster bad” philosophy, so it isn’t surprising that seeing what could easily be considered just another monster would elicit this kind of response. However, instead of being hurt or offended, Frog just shrugs it off. He’s likely used to this kind of reaction from people, and having to work on his own because of it. Lucca quickly recovers, though, and the three team up to rescue the queen. After fighting through the waves of monsters in the cathedral, the team eventually faces the monster in charge, and saves the queen. After returning her to the castle and retrieving Marle from whatever purgatory in which she was trapped, the group decides to return to their own time, but not before Frog says he is leaving. Disgusted by his own inability to keep the queen safe, he leaves in shame to live in seclusion, likely much the same as he did before hearing of the Queen Leene’s disappearance. Even though everything worked out in the end, Frog is incredibly hard on himself, thinking that, if he had just tried harder, maybe Leene wouldn’t have been kidnapped in the first place. It isn’t explained at this point why Frog feels this way, but things become clearer later on. Much of Frog’s difficulties revolve around two key items: a medal and a sword. Understanding what is going on in Frog’s head means understanding the significance of these items. We don’t hear from Frog again until a little later in the game when the gang travels back to the Middle Ages. Now on a mission to stop the evil Magus, who Crono and company think is the creator of Lavos, the lifeform that triggers the apocalypse, the group finds that the war between Guardia and Magus’s forces is now in full force. The king has been injured in battle, and it is now believed that only the mythical “Hero” can save the kingdom from Magus’s forces. The Hero who will totally save the kingdom. The group finds that a young boy from the southern continent named Tata is in possession of the Hero Medal, making him the savior that can defend the kingdom. Apparently, all you need to be a hero is a badge to prove it. I love this logic. Tata has gone to Denadoro Mountains to the north to claim the evil-slaying sword, Masamune, so that he might take on Magus. As the group arrives, they see Tata being chased by a horde of monsters. After the group fights them off, Tata comes back and tells them that it’s too dangerous, and runs home, leaving Crono with the burden of retrieving the Masamune. After climbing to the top of the mountain, and defeating the spirits guarding the sword, the team claims their prize, but it turns out the damaged blade of the Masamune is all that remains. Returning to Porre Village, the group finds Tata in his home, who confesses that he isn’t really a hero – the medal was actually dropped by a strange frog-man. After doing a little asking around, the group finds that a certain forest is infested by frogs. After some investigation, the group finds a hovel hidden by some bushes. Suddenly, Frog jumps out of the shadows and greets the group. Upon hearing of the king’s injuries, Frog becomes crestfallen, saying only a hero could stop Magus now. 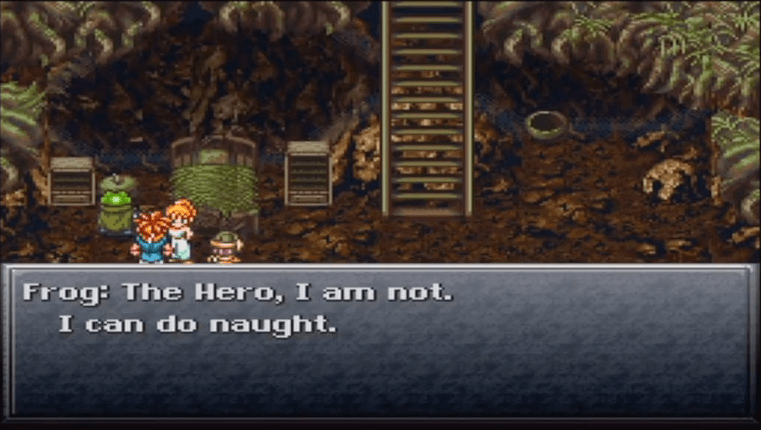 Upon being presented with the Hero Medal, Frog is shocked that it was in Crono’s possession, but says he has no right to it. Even so, one would need the Masamune to stand a chance against Magus. After rooting through Frog’s possessions (as friends do), the gang is shocked to find the hilt to the Masamune. Why would Frog have a piece of the mythical blade? After a short* trip to the Prehistoric era, the team finally collects all the necessary materials needed to repair the Masamune. Returning to Frog’s home, they show him the reforged sword in all its glory. Frog is shocked, and says he needs some time to process these new developments. During the night, Frog has a dream about the heroic knight named Cyrus and his friend, Glenn. Cyrus embarks on a quest to take back the Hero Medal, which has been stolen by the Frog King, and retrieve the Masamune. After handily defeating the Frog King, Cyrus and Glenn make their way to the Denadoro Mountains to claim the Masamune. There, they are attacked by Magus and his second-in-command, Ozzie. Cyrus is soundly defeated by Magus, and the Masamune is badly damaged in the process. Cyrus tells his friend to run away, but Glenn is petrified with fear, and unable to run away. Ozzie scoffs at this development, and Magus, rather than killing Glenn outright, casts a spell on him, after which point the young man falls off a nearby waterfall. After the dream ends, we see Frog contemplating the reforged sword before him, wondering if he can really take Cyrus’s place after ten long years. 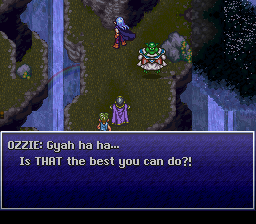 The next morning, Frog informs the team that, though it may be foolhardy, he will accompany them to battle Magus. While he still seems to have a lot of doubt in his heart, Frog has at least resolved to stop hiding, and will work to right the wrongs of the past. Thus, Frog joins the group permanently, but his evolution as a character is not yet done.